What’s tougher than a diamond? You’ll never guess! Our recent gemstone spotlight, featuring Jade, inspired us to dig a little deeper into what exactly the Mohs Hardness Scale is, and also the difference between hardness and toughness. Jade is a very tough stone, but not a very hard stone. In ancient times, it was used to create weapons and other tools, yet only falls between 6 and 7 on the Mohs scale. How could that be? The answer is that toughness and hardness are not the same. Hardness (which is measured on the Mohs scale) determines how easily a mineral can be scratched, while toughness judges its ability to withstand breakage, as from a fall or impact with another object. 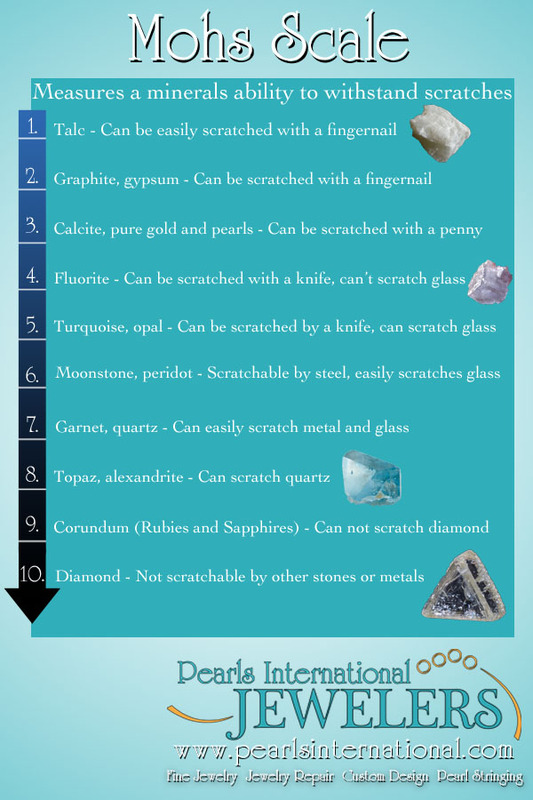 While the Mohs Scale consists of a numerical scale of 1-10, the toughness scale is a little less specific. There is not yet a standardized test for measuring toughness, and minerals are graded on a scale of Exceptional, Excellent, Good, Fair, or Poor. Diamonds, which are commonly known as the hardest natural mineral, sit at a solid 10 on the Mohs scale. However, they only rank as far as “Good” on the toughness scale. Jade, however, ranks as “Exceptional” and is therefore considered to be tougher than a diamond, although it sits at a 6-7 on the Mohs scale. GemSociety.org uses the comparison of wood vs. glass to help you remember the difference between toughness and hardness. Glass is very hard and can easily scratch wood, but wood is very tough, so if you bang a piece of glass and a piece of wood together the glass is more likely to be broken by the piece of wood. With this logic, diamonds can easily scratch jade, but what happens if you whack a piece of jadeite and a piece of diamond together? The diamond could crack, but your jade will probably come away a little bruised, but not too much worse for the wear. Now you know! What’s the deal with so many pearl colors?